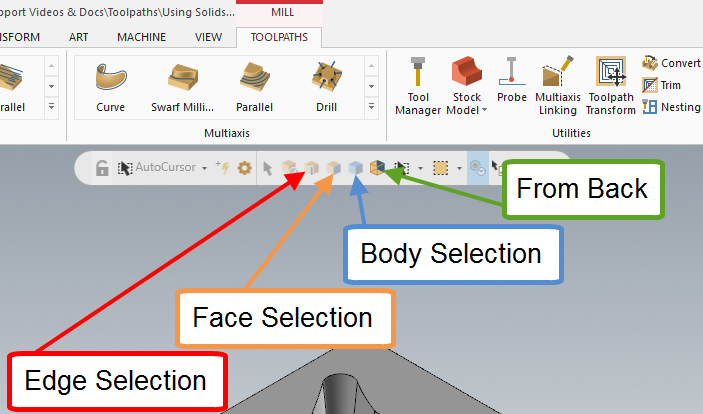 Solid features can be selected for the entities required for toolpath creation. How these features are selected can be slightly different depending whether 2D toolpaths or surface toolpaths are being used. These toolpaths will allow wireframe and/or solid(s) to be selected. These toolpaths are contour, drill, pocket, face, engraving, and 2D High Speed Toolpaths. When selecting the entities to be used, set the Chaining type to Solids. These toolpaths require surface(s) and/or solid(s) to be selected. When selecting from a solid, a specific face(s) or edge may be required while excluding the rest of the solid(s). In order to make this available, Solid Selection needs to be activated while selecting the entities. If this is not activated, the entire solid will be selected. Once activated, the type of selection can be set. The Mill Level 1 course was my first real entry into CNC programming and while we were pressed for time it was a clear and well thought out intro. I learned more than was necessary and I do have a more clear understanding for programming different types of projects. I appreciate the whole learning experience and look to using my new programming talents in the future, many thanks to all the staff who helped out.